December has seen the start of a long-term, £250,000 commitment to improving manual skills, boosting the local construction industry and helping young people into employment, with the launch of the Sherford Skills Training Scheme. Bovis Homes are part of the consortium of house builders behind the scheme, which has been put together following consultations with local authorities, key partners and training providers. The Sherford Skills Training Scheme will provide training, experience and long-term employment opportunities during every phase of the major new Plymouth and South Hams community's construction, providing a lasting legacy for local people. The lead delivery partner, following a competitive tender process, will be City College Plymouth. Both City College Plymouth and one of their partners, South Devon College, have exemplary track records in engaging young people, and will assist the Consortium in delivering the training programme and co-ordinating with local schools, agencies and the surrounding community. Giving local people a significant role in building the region's biggest community development, the scheme will provide practical experience and qualifications in various areas of construction, including groundworks, roofing, carpentry, plastering, plumbing and bricklaying. Participants will also gain valuable experience in project management, health and safety, large scale development processes and onsite communication. Local schools and community groups: will be invited to visit the Sherford site, educating children on all aspects of construction, with insight provided by skilled project managers. Young people/school leavers: will receive interactive information, guidance and advice via local schools and colleges, enabling those aged between 14-18 to understand the skills, training and employment opportunities available at Sherford and how to get involved. Apprentices: by working with local colleges, work experience, Apprenticeships opportunities will be available at Sherford, with structured sector support also being made available with the provision of a Skills Training Scheme Co-ordinator. Local unemployed people: working with Jobcentre Plus, those who are looking for work, or looking to retrain, will be able to gain construction experience at Sherford, equipping them with the necessary skills to progress professionally. Wider participation in construction: in addition, the scheme will also be actively targeting women in construction, as well as the upskilling of local tradesmen. Paul Boileau, Sherford Project Manager, Sherford Consortium said: "Sherford is a community being created for the local community by the local community. The scheme will provide real experience in every phase of the development, from initial groundworks to the completion of house-build. "The scheme is just one example of how young people can become involved in large-scale developments, benefitting not just individuals but also the surrounding community, making a lasting legacy. By providing people with the necessary skills and expertise to develop professionally; it has the potential to significantly support the region's economic growth and employment landscape." Commenting on the need for the scheme, Peter Mercy, Director of Technology Marine & Renewables, City College Plymouth added: "The changing nature of the South West's construction industry means it has never been more important to help people gain practical experience to assist them in gaining access to employment. We are proud to be one of the partners helping to deliver the scheme, in what is one of the region's largest and most innovative community developments. "Sherford is an exciting project, which can provide training across almost every area of construction, as well as providing longer term career opportunities. The Sherford community will be under construction for years; there is every chance a young person may learn their trade there, go on to have a career within the industry, and perhaps even live there." Leader of Plymouth City Council, Tudor Evans, said: "Through our innovative Building Plymouth plan we've been trying to narrow the skills gap by getting more people into construction for some time now. We've been working very hard to improve the links between the sector, our education establishments and our young people to make them aware of the doors that are open to them in construction. It's fantastic that a ground breaking project like Sherford is also going to help develop our young people and offer them opportunities in the construction industry." South Hams District Council's Executive Member for Strategy & Commissioning, Cllr Michael Hicks, said: "We have always felt that Sherford could offer young people in the construction industry a real opportunity to begin their career on a fascinating and unique project, imagine being able to say 'I learnt my trade while building a new town'. 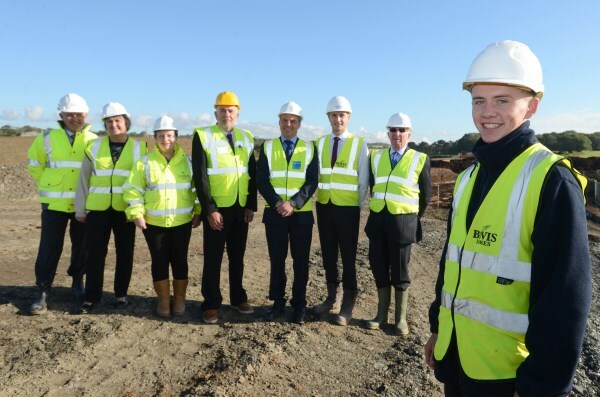 We are delighted to see this new training scheme being launched and are pleased that our vision of young people being able to learn and train during the construction of Sherford is being fulfilled."